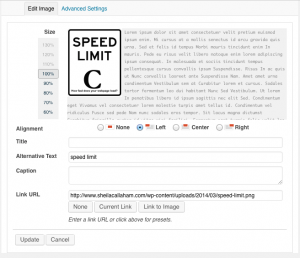 Speed Up Your Website with this Easy Tip! How fast do we expect our pages to load? 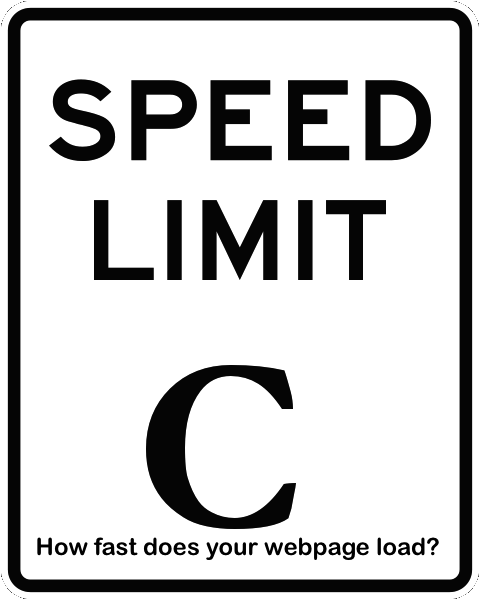 Try C—the speed of light in a vacuum! Whether you are an indie writer, coach, or consultant your website is one of your biggest marketing tools. That’s why it’s important to ensure your website personifies professional excellence. Not only should the design be aesthetically pleasing, your website should represent your service or product in a compelling way. Finally, its delivery must be reliable and fast. Real fast! That’s not too challenging with text, but when it comes to handling images, things can get tricky. Luckily, I’ve got a tip that will speed up your page loads to the speed of light. If you’ve ever clicked into a website that took more than one second to load, you probably noticed. Why? Because we’ve been programmed to expect information almost instantaneously. When viewers have to wait for pages to load, they lose patience. In my latest website overhaul, I learned that a common blogging practice was slowing down my site. Because I was using a tool built into the WordPress template, I’m betting others are doing the same thing, too. If you load a photo into your post and you don’t like the size, you click on the on the image to access the Edit Image tab. From there you have the ability to adjust the sizing with the by clicking on the size ratios on the left-hand side. Don’t do it! What you might not know is that even when you reduce the size of your image using this process, the image still loads in it’s original size, which means that a visitor to your website still downloads the full image. That increases the amount of data a visitor has to download every time they visit your page. 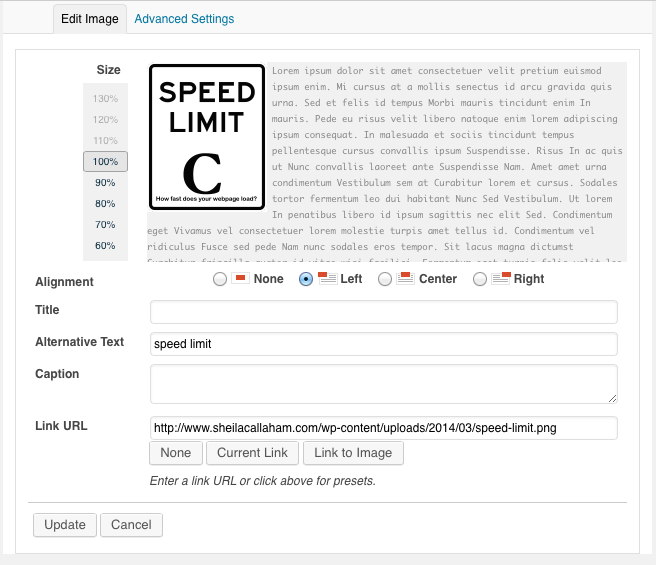 To avoid this catch-22, edit the image to reduce the height and width before you upload it to your site. Additionally, there is a WordPress plugin called Smush.It that automatically reduces the image file size and improves site performance. All you have to do is download the plugin and it automatically scans each image you upload to ensure the smallest compression and fastest load speed. You don’t have to do anything! Between uploading right-sized images and knowing that Smush.It is taking care of the rest, you’ve just enhanced your website operations. If you’re compressing an image from 214 KB to 22 KB, week after week, that adds up to speed. Maybe not the speed of light — technically speaking — but pretty darn close.